NASA's Phoenix Mars Lander has a scoop on the end of its Robotic Arm. A motor-driven rasp can be lowered at an angle through a small opening in the bottom of the scoop to aid in gathering shavings of hard-frozen material. 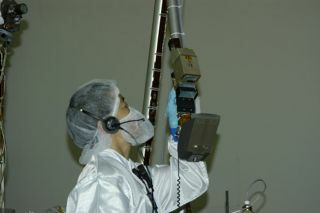 In this image, Lori Shiraishi, an engineer at NASA's Jet Propulsion Laboratory, inspects the scoop while the spacecraft was being assembled and tested before its Aug. 4, 2007, launch. The PhoenixMars Lander set to land Sunday may represent a clean slate for NASA?s pastfailed or canceled Martian missions, but its technological lineage alsoresembles Frankenstein's monster. Thespacecraft will land on the red planet with baggage that includes abackhoe-like robotic arm, a miniature chemistry set, and a laser-guided weatherstation. "Mostof the instruments have heritage from other missions," said Michael Gross, Phoenix payload manager at NASA?s Jet Propulsion Laboratory in Pasadena, Calif.
Thoseheritage technologies developed for previous Mars missions such as MarsSurveyor Lander and Mars Polar Lander came in useful to outfit the $420 millionPhoenixmission, which seeks to uncover the history of water on Mars by diggingbeneath the arctic surface. The spacecraft is set to land on May 25 on asix-month mission to determine whether the region may have once been habitablefor primitive life. However,Gross and other engineers had to remind themselves that Phoenix?s newscience mission came with new demands. "Wewere counting on the heritage of the 2001 [Mars Surveyor Lander] arm, and wehad to redesign the whole thing," Gross told SPACE.com. "There's a comfort level, but also pitfalls with heritage that you want tomake sure you don't walk into." Theoriginal robotic arm lacked the physical power to dig into the frozen Martian tundra,so engineers strengthened the joints and switched the arm material fromaluminum to steel. They also replaced the original scoop with the Icy SoilAcquisition Device (ISAD), which has several tricks to deal with theice-hardened layer beneath the looser regolith soil on the surface. First the nearlyeight-foot (2.3 meters) robotic arm uses a backhoe motion to clear away looseregolith and expose the icy layer. A blade on the front of the scoop can try abit of scraping, but the real digging for ice samples requires a small drill inthe back of the scoop. Thespring-loaded drill is sprung against the ground and turned on, rotating andgrinding against the icy soil using the spring?s pressure. Wrist movements pushthe loosened ice samples into a chamber for further testing. ?Withinabout a minute or so, it kicks a fair amount of material into the scoop orchamber,? said Peter Smith, Phoenix principal investigator at the University ofArizona, Tucson. Smith added that the drill would do its excavation two orthree times. The roboticarm also has scraper blades on the bottom that can clear away material andcontinue tearing up the icy regolith, Gross said. The arm can dig down as faras 20 inches (0.5 meters), the deepest that anyone has gone on Mars. Once Phoenix secures samples, it breaks out the first-ever wet chemistry lab on Mars. TheMicroscopy, Electrochemistry, and Conductivity Analyzer (MECA) allowsscientists to analyze loose regolith soil for levels of acidity, minerals, andconductivity, using single-use beakers the size of teacups where Martian soildissolved in water can be soaked, stirred, and measured. MECA willalso use atomic-force microscopes that can examine the Martian soil down to 10nanometers, or 10,000 times thinner than a sheet of paper — the smallest scaleever examined on Mars. Signs of clay or other material in the loose regolithcould indicate the past presence of water. Another MECAinstrument can detect any lingering wetness in the regolith soil, and examinehow heat changes within the soil. The thermal and electrical conductivity proberesembles a spiked ?knuckle? that the robotic arm can dig into the excavatedarea. ?The uppersurface stuff done by MECA can look through the dry environment for remnants ofwater,? Gross said. ?TEGA [Thermal and Evolved Gas Analyzer] will actually lookfor the water.? The roboticarm will feed soil and ice into eight TEGA ovens, each the size of a ballpointpen ink cartridge. The one-use ovens can then slowly heat the samples up to1,000 degrees C (1,800 degrees F), which allows scientists to measure andanalyze any changes from solid to liquid to gas. The TEGA tool also contains anew spectrometer that can sniff heated gases for their chemical signature. With sixmonths to study Mars and only a limited number of ovens and beakers, Phoenixresearchers plan to take extra care in choosing exactly which bits of Martiansoil and ice to test. ?It?scalled negotiation,? Smith has said. ?We?ll get in a room and we?ll negotiate.If it comes up to me, I?ll make the decision.? Most of the Phoenix mission?s new technology rests in the Meteorological Station (MET),which can bounce powerful laser pulses off dust and ice particles in the Martianatmosphere. The reflected pulses will provide information about the atmosphericparticles. Thecombination of old technology and newer instruments required a lot of ?systemengineering making sure everything would play together,? Gross noted. But theproud international heritage of instruments from the United States, Canada, and Germany will hopefully help Phoenix hit Martian pay dirt after its nail-bitingdescent. ?Once itlands, it doesn't end,? Gross said.